Coconut oil is an amazing product! Most of us know it’s good for cooking with but there are so many other reasons to keep this gift from nature in your cupboard. Coconut oil has some wonderful health and practical properties too. 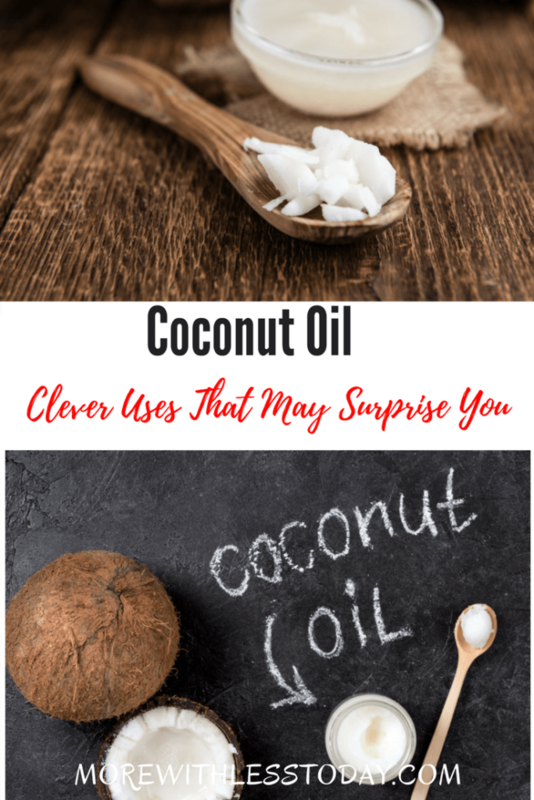 Here are some clever uses for Coconut Oil that may surprise you. Coconut oil is fantastic for softening and hydrating dry skin. You can rub it on dry skin spots or use it as you would any other skin moisturizer. It works well on cracked skin like those found on your feet. Make a DIY massage oil by adding a few drops of your favorite essential oils to your coconut oil. Try lavender at bedtime. It’s the perfect massage oil. You will love it! If you combine coconut oil with some baking soda you have a great spot remover. This works great on carpets and furniture. If you need to remove a label from something coconut oil can help with that too. Once you have removed all of the labels you can coat the rest with the paste, let sit for 15 – 20 minutes and wash. You can also use it to remove gum. Make your wood look it’s best by using coconut oil as a wood polish. If you have a wooden cutting board rubbing coconut oil on both sides will help keep it in nice shape. It not only makes the wood look great but it helps keep dust away. It can spoof up leather too. Make your own lip balm and toss out your chapstick. It will hydrate your lips and provide natural sunscreen. Here is a great recipe for making your own lip balm. Coconut oil works as an aftershave to soothe sensitive skin. Remove your makeup and see your skin glow! Let it sit on your face and then remove it with a cotton pad. Coat your hair with coconut oil before swimming in the ocean or pool to provide a barrier so your hair absorbs a minimum amount of chemicals and salt. Apply coconut oil to your dry cuticles and soften them right up. Coconut oil is rich in fatty-acids and it absorbs quickly. It makes a great skin moisturizer. Mix a half cup of coconut oil with a handful of coarse salt or sugar to exfoliator. Everyone needs coconut oil in the kitchen. It is great for sautéing, frying or anything you would use oil for when cooking. It doesn’t oxidize at high heat so its great for grilling. Cuts and would heal faster when you place coconut oil on them. It boosts collagen and reduces inflammation thus speeding up healing. If you have a deep wound or cut, seek medical care first. As you can see there are so many wonderful ways to use coconut oil. Make sure you keep a stock on hand at all times.